They say Ek Thi Daayan is a horror film. We would say the taste of the pudding is in the eating. Thanks to films like Atma and 3G, B-town hasn’t really managed to give us the shivers in 2013. So when Vishal Bhardwaj and Ekta Kapoor come together to whip up some horror and thrills, our expectations obviously run high. That however proves to be the undoing of the film. 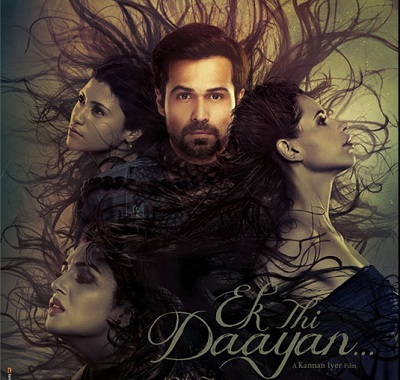 Ek Thi Daayan could well have been named “Ek Thi chipkali (lizard)”. It freely borrows from popular culture and notions about witches – long hair and twisted feet who eat up kids, dimly lit rooms, screeches and shrieks with well timed regularity and of course a doll with scary eyes! All this is present but what we crave for is something more. Something that could catapult this Friday horror release to cult status. After all the ammunition is there. A brilliant cast, awesome background score that Mr. Bhardwaj’s presence guarantees, the sixth sense of Ms Ekta Kapoor…so what could possibly explain the fizzling out of this film which starts with such promise? Probably its bovine adherence to the unwritten never yet broken rules of the horror genre therefore giving us nothing new. The film starts with aplomb. We enter the world of Bobo the magician (Emraan Hashmi). He along with his loving girlfriend Tamara (Huma Qureshi) plan to adopt a sweet kid from the orphanage. It’s their sweet happy world till a freak accident during one of his magic shows makes Bobo feel the “Daayan” from his childhood is back to get him. The movie screeches in reverse gear and we witness the brilliant performance by two young child actors; Vishesh Tiwari who plays the child Bobo is a treat. Konkona Sen Sharma effortlessly plays the “Daayan” almost overshadowing Huma’s vivaciousness with her class act. Honestly the setting up of the story and its slow evolution grabs our attention. So while we quite generously scuttle our laugh at the “Daayan” of all names being called Diana and Bobo getting to know everything there is to know about witches and the other world from a shoddy single book, the camera angles, performances and the background score do give us a lot to keep quiet about. Post interval we trustingly sit all set to take our feisty flight into the dark world of witches and super natural clutching our popcorn basket tight when…when - nothing happens! Yes the music reaches a crescendo all right but it’s a diminuendo as far as actual thrill is concerned. The spine chilling moments and the goose bumps are almost missing. The story becomes tedious. In walks Liza Dutt played by Kalki Koechlin and after all the hits and misses the film ends on a strange haphazard note one is bound to feel cheated about. So just like our class teacher told us “he has a lot of potential but needs to work hard” that’s what we want to tell debutant director Kannan Iyer. This could have been magic, black magic but ends like a cheap badly disguised act from a trickster. We feel bad for Emraan Hashmi who does work with such sincerity on such shoddily written scripts. “main chotti kaat dunga” the poor fellow keeps repeating with Dharmender-ish zeal but it’s just too late. The film is a damp squib post interval. Go for it only for the first half and the performances. A leisurely loo break could be reserved for the second half. Alas it could definitely have been much much better!